Every violinist, be it beginner or advanced, will have a set of a violin kit, which includes the violin itself, and violin accessories like violin shoulder rest, strings and rosins. However, like most things, the violin and its accessories are subjected to wear and tear too. As we play our violins, we will realize that we might need to change its strings, replace its bow, or simply get a brand new violin. How To Choose Violin Accessories? We violinists would always like to get the best for our violin accessories, to ensure that we could play it well and always be ready for any performance. Though we do not have to buy the most expensive violin kit and accessories, we need to know how, and where we could get the best suited one for our playing. Here at this page, you will find guides about choosing the best violin accessories for you. Every individual guide below will contain an in-depth information on how to choose that best violin accessory. How To Choose A Violin? Before we get anything else, we have to have a violin first. Hence, we have to know how to choose a violin that is suitable for our playing. 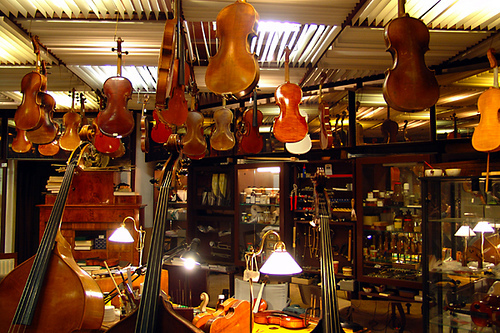 This guide includes the 6 criteria you have to know when you choose a violin. You will also learn the best way to buy the violin you want. How To Choose Violin Strings? Violin strings are considered one of the most important violin accessories we must have. Most violin strings come with the violin which you buy, but most do not sound like how you want them to be. How do you choose violin strings that suit your needs? This guide will tell you the difference between the 3 types of violin strings in the market, and the quality of sound each produce. How To Choose A Violin Bow? Violins are played with the violin bow. Like strings, you get your bow when you buy the whole violin kit. However, some violin bows do not match the violin. Now, learn how to choose a violin bow that will help you play better. Find out the 5 qualities of a good bow, and 4 factors which determines the price of a bow. How To Choose Violin Rosin? The violin rosin is an important violin accessory, as it determines how the violin will sound when the bow grips the strings. While you can get violin accessories like the rosin everywhere, an unsuitable one will make violin playing uneasy and difficult. Find out the 4 criteria in choosing your violin rosin. How To Choose Violin Cases? Violin cases protect your violin and help to keep other violin accessories you need. While violin cases comes in different shapes and sizes, most perform difference duties in protecting the violin. Check out what are the basic protection the case must provide, and also some cool protection devices found in expensive violin cases. How To Choose A Violin Bridge? Most violin bridges comes along with the violin bought, but violinists do change their violin bridges if they affect their playing. Though it is one of the smallest violin accessories, the violin bridge plays a major role in the sound of the violin, especially its tone and volume. You might not need to change your violin bridge now, but find out the 4 qualities of a good bridge! How To Choose Violin Mutes? Violin mutes are sometimes seen as an unnecessary violin accessory for our violin playing, but it does make a big difference in the volume produced by the violin. As the name suggest, it mutes the violin down, so it can be played softly in different occasions. How does it work? Which violin mute works best? Find out here. Do You Really Need A Violin Shoulder Rest? The violin shoulder rest provides a cushion for your shoulder, and also raise the height of the violin. However, it is also argued that the shoulder rest may hinder the playing of the violin. Is that true? How does a violin shoulder rest hinder the music played by the violinist? Are there alternatives? Find out in this guide.